Minor hockey. It evokes so many good emotions and memories. It makes a lot of us feel proud about Canada’s place in the hockey world: First. Unfortunately, it also conjures up loads of stories about crazy hockey parents, the cost to play and the insane focus on the hourly schedule of boys and girls. This time of year, the peak of minor hockey, the winter season anyways, is met at provincial championships across all provinces. Regional championships then transition into spring hockey, summer training and back into winter. At HockeyNow, we believe in all the good things that hockey can bring to kids and their families and endeavour to tell the good stories. One great story, if I do say so myself, is about our Minor Hockey Player of the Year award—from its humble beginnings to its lofty future. It all began about nine months after HockeyNow produced its first issue, in the dark ages of 1999 before we even had a website, shortly after I got my first email address and just before I got my first work computer. Scott Carter, the founder of the BC Hockey Hall of Fame, called us one day and said he loved what we were doing and suggested that we help promote excellence in hockey in B.C. by creating a Minor Hockey Player of the Year award. He wanted the Hall of Fame to be the home of not only the award presentation, to take place annually at the induction ceremony, but also a permanent plaque displaying all the winners. So we put together a set of criteria and a committee that consisted of our staff, Scott and some people on the board, most of whom were BCAHA executive (now called BC Hockey). Looking back over the last 15 years, the list—which can be seen online at hockeynow.ca/events—is a really impressive one. It includes six first-round NHL picks, including one first overall in Ryan Nugent-Hopkins, a full-ride NCAA scholarship winner in Tyler Burton, and a two-time Stanley Cup winner in Colin Fraser (the original winner from 2000). Keep your eye on Morgan Rielly and Griffin Reinhart (co-winners from 2009), and Curtis Lazar, the Ottawa Senators’ first-round pick in 2013 and in my opinion, Canada’s best all-around player from start to finish this last World Junior tournament. OK, enough about B.C., right? In 2012, we took a good look at our award program and decided to revamp and update the criteria and selection process—all the while keeping our focus on the original inspiration given to us by Scott Carter to promote excellence and grow our game. We added B.C. Hockey Hall of Fame inductee and Vancouver Canucks alumnus Dave Babych, who is currently a player development consultant for the Canucks, as our selection team chair. He helped pull together a world class group of scouts and coaches to make up our selection team. 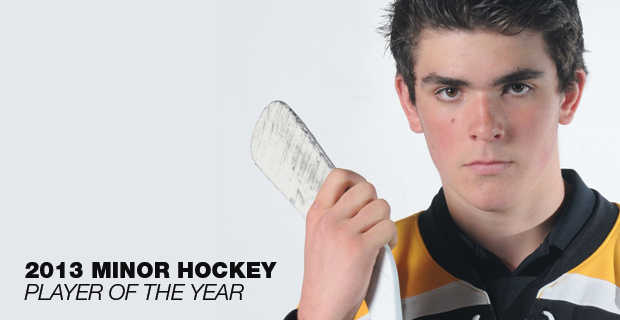 2014 will see the addition of a HockeyNow Minor Hockey Player of the Year awarded in Alberta and Ontario. Babych has agreed to chair those teams as well. We frequently liaise with Dave and our regional scouts and coaches to regularly update and discuss our lists of players as we work toward picking a winner in each region. This year, we formally added Dennis MacInnis and his team at International Scouting Services (ISS). If you aren’t familiar with ISS, I encourage you to get to know them. They are the world leader in scouting. As just one example of ISS’s credibility, all but one NHL team buys its scouting packages to help their scouting team, which is pretty impressive to say the least. Dennis, ISS’s founder, is on all three selection teams and works tirelessly to contribute to our regional lists. We can’t wait to announce all three winners later this spring. If you follow our lists and coverage and see a player you think we missed or are wondering about any of the details of the award, by all means please contact us at the office. Minor hockey. It’s the greatest, eh? It represents the fabric of our nation. We all spend countless hours of our lives playing, coaching, covering, worrying, driving, laughing, crying, wondering and most of all dreaming.